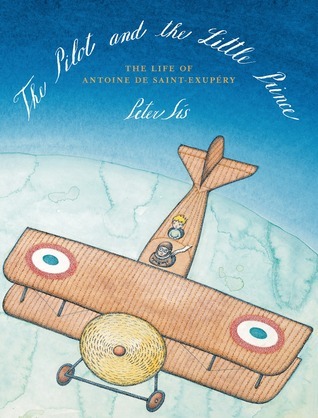 A fascinating look at the life of Antoine De Saint Exupery, notable author and pioneer pilot. My only quibbles with the book: I found the delicately scripted captions around smaller illustrations hard to read and I desperately wanted an author's note providing more information about Saint-Exupery. The intended audience for this book, young readers, won't have the same demands, I suspect. A delightful book by one of the best author/illustrators working today. the illustrations are amazing and the little snippets of info within the illustrations are great too but Peter Sis focused too much on Antoine as an aviator. I am aware that it may be the intent of Peter Sis. but he could add a little bit about Antoine's motivations to continue flying after so many disasters or why he writes. can anybody recommend a good biography on Antoine de Saint Exupery? St. Exupery's golden life, full of dreams, fits Sis's style of poetic story telling and illustration - impressionistic, circular like the shape of the world, connected to the universe. This is a special biography to be poured over. It is about details and connections and always something larger. Beautiful. Peter Sís is incredible. I could frame each page in this book and hang them up. I love how the illustrations are similar to Saint-Exupéry's but not mimicked. It is still very much Sís. Gorgeous picture book biography of one of my favorite authors. A stunningly illustrated and designed picture book biography of the fascinating French pilot and author best known now for writing The Little Prince. Inventive and gorgeously detailed illustrations make this title memorable, even though the format of the text (average type size and layout on the bottom of the pages, with tiny type arranged out around small, circular inset illustrations elsewhere in each spread) make it difficult to decipher and thus challenging for young readers. In short: visually arresting, but textually confusing. Read for Librarian Book GroupFor some reason, there were three different levels (and fonts) of text on nearly every page in this book. It was confusing and made the information very inaccessible. Overall, a very frustrating book and one that people had trouble coming up with anything nice to say about it. I was excited about sharing this book with my son based on the reviews, but the way it is laid out and how things are explained are way too complicated for a kid his age- which is weird considering this is written out to be a younger children's book. I just found it a bit confusing to navigate. Mám rád Petra a mám rád i jeho knížky. Nemít je, byla by moje knihovna o mnoho pustější… tady není o čem psát. To se musí prohlédnout, přečíst… a nechat se unést příběhem, skrytým ve famózní Petrově kresbě. Je fajn mít přátele, kteří umí takhle nádherné věci. Sis stirs together images and words (as is his wont) to create a biography of his subject's mind as well as his body. Hard to read, like most of his books, and probably more absorbing to adult readers than to children---but a thoughtful view of St. Exupery's inner and outer lives. Good information in this book, however, the layout of the captioned illustrations make for a bit of confusion. Do I read from left to right or top to bottom? Beautifully done. My question is audience?????? Can't get kids interested. Maybe just here? The combination of long foreign names and the miniscule, loopy-patterned, and italicized writing darting all throughout the pages, my eyes really became taxed. The design choices make it difficult to read, most of the facts are superfluous, pretty boring overall.